Cement tiles naturally create an Old World ambiance with their traditional patterns and color variations that occur from being a hand-crafted product. For this Italian restaurant, using cement tiles was an obvious choice not only for their time-tested durability, but also for their effortless ability in helping to create a quaint, yet sophisticated, atmosphere. This Italian restaurant uses a cement tile border pattern in rows to create charm. The cement tile rugs for this commercial installation feature rows, or "stripes of pattern," using our Yuna border pattern. While there may not be anything inherently Italian about the pattern, the choice of color and rich detailing create a look from another era. For a different take on the cement tile rug, consider using border patterns laid in rows. Using only border patterns, create a cement tile rug by laying the border pattern in rows next to one another. You'll notice the motif changes drastically, depending on whether you're looking at the "stripes" straight-on or at an angle. This effect is great at grabbing the attention of passersby, and we're told, it has also helped pull curious and hungry customers into the restaurant. 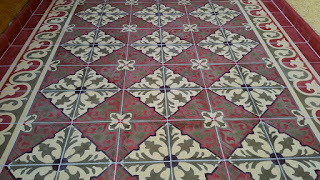 A cement tile border pattern can be used to create a rug. The pattern's motif appears to change based on the angle you are viewing it from. The changes in the pattern create eye-catching appeal and interest. The flexibility of cement tile in design is amazing. Notice how well this motif works with the Roman columns and marble architectural details around the windows? Thanks to the pattern and classic color choices used in this bistro project, these cement tiles have effortlessly created an outdoor dining patio and entry reminiscent of an Italian hillside eatery. DESIGN TIP - Using only border patterns, you can create a cement tile rug by laying the border pattern in rows next to one another. You'll notice the motif will noticeably change, depending on whether you're looking at the "stripes" straight-on or at an angle. If you'd like to see more photos from this commercial installation, then please view the slideshow below, or click to view Yuna Border Makes a Striking Floor. With all of the color and pattern customization options available, it's easy to see why cement tiles are a designer's dream. If you are a hospitality, restaurant, or commercial design professional, then handmade cement tile is the Design Line that can work for you! Don't hesitate to contact us. We have the extensive knowledge and skill needed to make your vision come to life. But, don't take our word for it, take a look at these cement tile commercial installations. Pre-sealing cement tiles is not a required step in all manufacturers' installation procedures; however, it is something I recommend. Before deciding whether or not to pre-seal your cement tiles, let's make sure you understand the purpose of pre-sealing along with its benefits and risks. 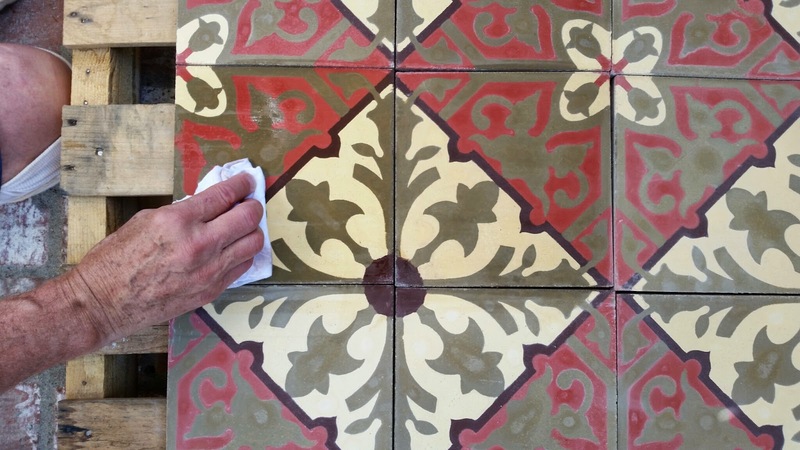 Using a grout release or pre-sealer on cement tiles helps ensure a successful installation. First, let's not confuse sealing with pre-sealing. After installation, sealing cement tile with a penetrating sealer is recommend because concrete is porous. The sealer help protect the tile from oil, acids and water. The purpose of a pre-sealer is very different. A good pre-sealer should do two things: it should clean the tile; and it should make grout clean-up, or removal, easier. In fact, a pre-sealer may be called a "grout release." When you see a finished cement tile installation (or any tile installation), it's hard to visualize how bad it looked when grout was first applied. The only way to get grout into the grout joint is by smearing it all over the tile. With a glazed ceramic tile, grout removal and clean-up can be difficult. However, a porous material like cement makes the task more arduous, especially because acids can't be used. 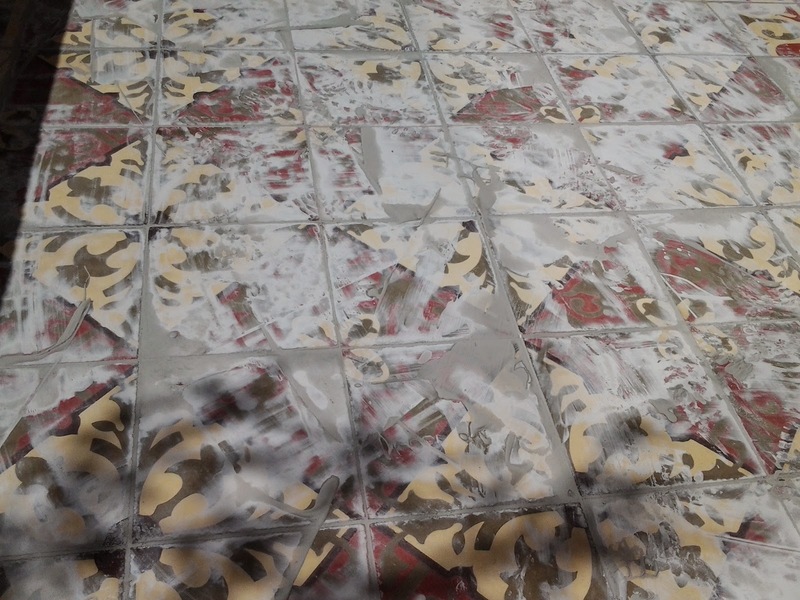 Grout being applied to patterned cement tiles - a messy job! The benefit of a pre-sealer or "grout release" is to make sure the grout can be easily removed after grouting. By apply a grout release prior to the installation of the tile, you also get the added benefit of inspecting each tile and the opportunity to cull any that might be damaged or off-color before the actual installation. The only downside is that pulling each tile out of the box and re-packing them is time consuming. Also, the more the tile is handled, the greater its chance for breakage. Using a grout release or pre-sealer on cement tile is not always required. 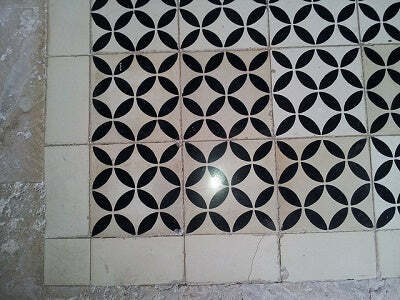 In fact, if you have someone familiar with installing cement tile, they may even laugh. After all, there were no pre-sealing products when cement tile was used more than 150 years ago. Rest assured, pre-sealing is another step that will help guarantee the project's success. While a penetrating sealer could be used (and is sometimes recommended), I prefer a water-based "green" product, such as Fila PS87. For pre-sealing, using it in its undiluted form will be less expensive than using a penetrating sealer. 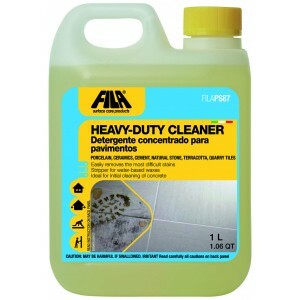 You can also dilute it to clean and remove grease and grime from the tiles after installation. It's an excellent product for acid-sensitive material, such as concrete. Applying a pre-sealer is not difficult, but it will take a great deal of time. As I mentioned, an added benefit is that you can view/inspect all of your tiles, and verify the quantity purchased. First, pull the tiles from the box and arrange them onto pallets. Place the tiles next to each other so you can match pattern colors. More importantly, this step will also help prevent the grout release from dripping down the sides of the tile. Now, apply liberally; but, be neat. 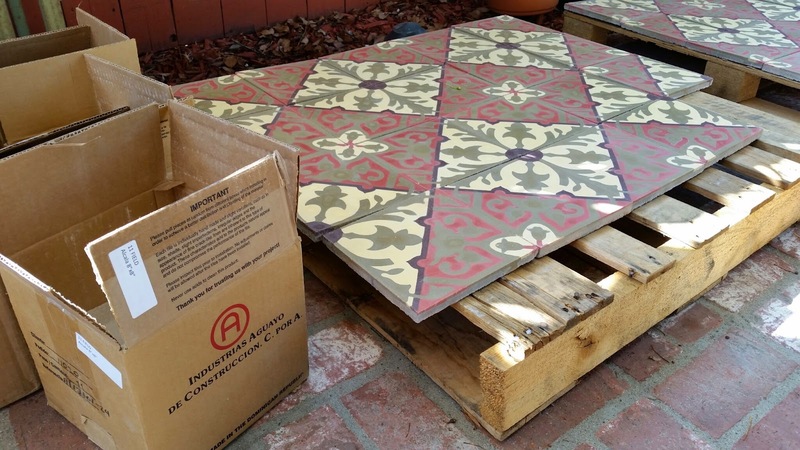 Cement tiles are removed from the box and placed on pallets prior to applying a grout release. Next, pour a small amount of the undiluted grout release into a container. Apply with a small, soft rag cut to a dimension smaller than the tile. Again, this keeps the pre-sealer away from the sides of the tile. You need the grout to stick to the sides of the tile. Make sure grout release does not drip down the side of the tile. We have recommended Fila products for years, but often, they have been difficult to obtain outside large metropolitan areas. Thankfully, you can purchase Fila PS87 and all Fila products in small or large quantities online at SealersRus.com. The owner of the company, Ali Madani, is extremely knowledgeable about Fila sealers and their application for both tile and stone. 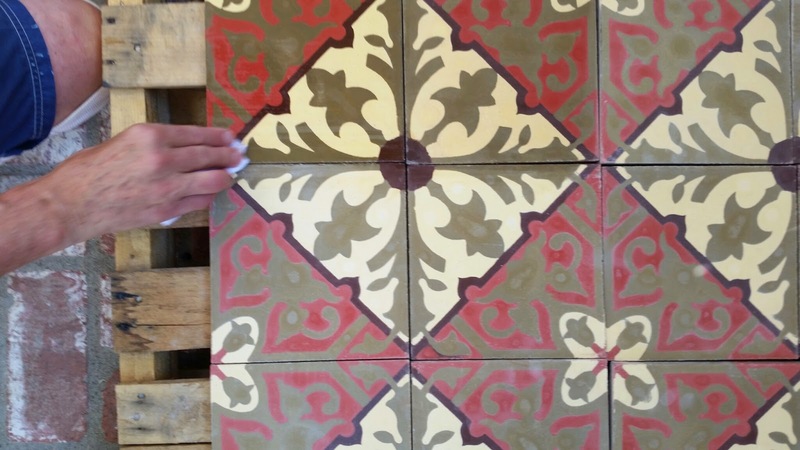 Fila PS87 is a water-based cleaner that can be used to pre-seal cement tile. Fila PS87 is a degreaser and cleaner for acid-sensitive materials like natural stone and concrete. It's ideal for basic cleaning of concrete and removes water-based wax. Use it undiluted for pre-sealing cement tile prior to installation. It will help ensure the tile is clean and assist as a grout-release. To learn even more and see how a pre-sealer is applied, watch our latest video, How to Apply a Grout Release - Cement Tile Install Tips. This short video shows how to apply grout release to cement tiles. This optional step is a great insurance policy to protect your tiles from the hazards of installers while making sure the grout is easily removed. 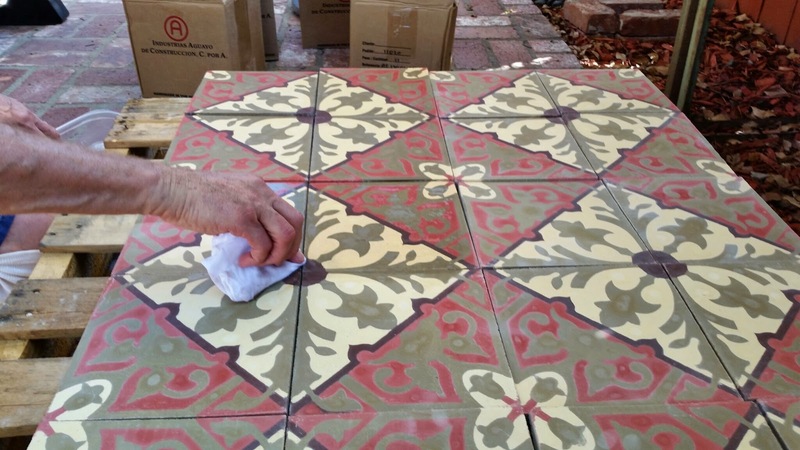 In the coming months, we'll be providing more tips on how to successfully install cement tiles. Stay tuned! Pattern adds detail and interest and often, very secretly infuses subtle meaning into a design. While color creates the atmosphere, the pattern's motif provides a sense of style and place when executed correctly ‒ especially in commercial hospitality design for restaurants. For instance, a simple fleur-de-lis can help transport you to France. help provide a sense of style and place in commercial design. If you read Arpi's recent post on Interlocking Circles: The Power and History of Pattern in Design, you begin to understand the power (and history) of this pattern and why it can evoke such a powerful spell that creates a sense of time and place with its style. While the interlocking circle pattern has its roots in Islamic culture, its clean form also works well with the Japanese restaurant design showcased in this post. There are two things I want to explore within this post. The first is how the motif appears to change based on how close or how far away you are. The the other is how the motif for the Geometric (Geo 10) pattern is maintained throughout the restaurant. The repetition of the motif helps maintain a sense of time and place along with other well-chosen design and decorative elements. items that work with the pattern to maintain a theme. The large, oversized carpets welcome guests and also provide patio-style dining outside. As you can see, a very simple 4"x8" white border is used to frame the rug while providing a seamless transition to the large stone pavers. The Geo 10 pattern (8"x8") is framed with a simple 4"x8" white border. The motif of the interlocking circles changes as your perspective and distance from the pattern changes. The motif of the pattern changes as your perspective and distance changes. The motif is barely discernible from a distance; but, the detail catches the attention of your eye and draws you near. your attention and draw you near. Did you notice the circle pattern on the entry doors above? Inside this Japanese-themed restaurant, you'll find an antique hand-carved door frame. sense, and place for successful commercial design. Take a closer look at the door details, and you'll find the interlocking circle pattern subtly establishes and reinforces a sense of time and place. The large interlocking tile pavers provide a sharp contrast to the smooth circle design while providing interest. The interlocking circle motif is repeated in other design details. I hope you enjoyed the brief tour showing how cement tiles and patterns helped to create a successful, cohesive theme for this Japanese Steak House. Because they are so durable, cement tiles are an excellent choice for commercial floor applications, or high-traffic residential spaces. 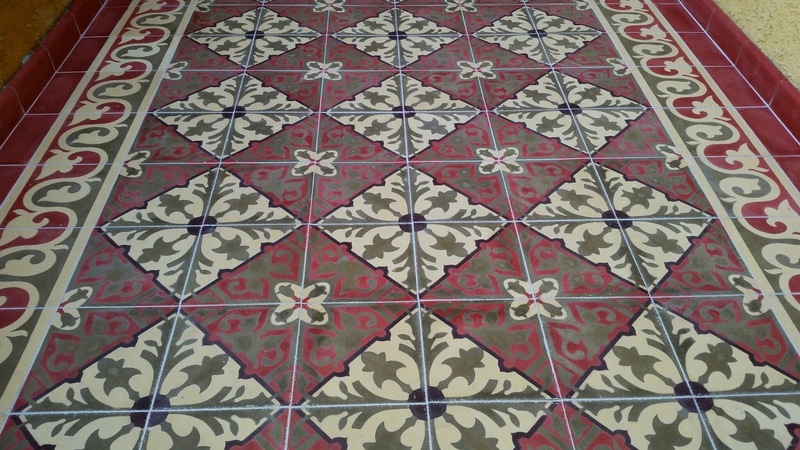 The use of cement tile in high-traffic areas is quite common throughout Europe and South America where it can be seen on the floors of centuries-old churches, homes and businesses. Further, with these highly durable products comes longevity. Cement tiles have withstood centuries of wear, which is an important factor for commercial floors. Cement tile's strength lies in its beauty, its skid-resistance, and most notably, its ability to age gracefully since the manufacturing process dictates for the color layer to be 1/8"-thick. I'll be sharing more commercial installations of cement tile over the next few months. As you can see, Avente's Geometric line, or Geo Cement Tiles, pay distinct homage to the time-tested and centuries-old patterns. However, with nearly 90 colors in the Heritage Color Palette, you can customize them to fit any color scheme or style. They work equally well in contemporary and traditional styles. With all of the available options and choices for color and customization, it's easy to see why cement tiles are a designer's dream. If you are a hospitality, restaurant, or commercial design professional, our "design line" of cement tile can work for you! Don't hesitate to contact us. We have the knowledge and skill needed to make your design come to life in tile. The above commercial installation of Cuban cement tile uses a classic rug design in rich, warm colors. The hypnotic pattern of our Cuban Heritage Design 110-3B 8x8 handmade cement tile features prominently in this resort's airy and grand entry. Nestled between architectural elements of arches and columns, this handmade cement tile rug, which features an original Cuban tile pattern and a polished finish, will withstand decades of high foot traffic with proper care and maintenance. Not only is it beautiful, but it adds to the sustainability factor with its long lifecycle. Cuban Heritage Design 110 3B 8" x 8" Handmade Cement Tile. Looking closely at the 110 3B cement tile pattern, you can see and appreciate the subtlest of details and the artisanal touches that went into making this tile. The tiniest nuances are accentuated with color and/or flowing decoration. Coupled with details and precision, handmade cement tiles are unlike any other flooring choice. Use the same size border tile as field tile. It makes the installation and layout much easier. If you choose to use border tiles that are a different size from your field tile, your rug width and length must be a multiple of both tile sizes to avoid unsightly cuts in the border pattern. Don't run the border to the edge of the room. Allow for at least one or more rows of solid colored field tile outside the border. Center the rug in the main area of an irregularly shaped hallway or entry. An extremely level surface is critical for any cement tile floor installation. Handcrafted cement tiles are capable of grabbing the attention of anyone who enters your home or establishment from the moment your guests walk in. Read more about How to Create a Cement Tile Rug Design. For more information about cement tile selection, customization services, or available sizes, shapes and more, please see our new Guide to Buying Handmade Cement Tile.